How I won a Money Betting on a Horse Race? It has been a very long time since I was at the race track but it is something that I did for a period of time when I was in college. Not that I had any disposable income in those days to be betting on horses but it was a great way to spend time clearing my head and to get together with friends. A $2 bet was about the maximum I would ever risk, which pretty much meant that if I bet on five or six races and had a drink and something to eat, I would end up spending about $25. I considered this to be good value entertainment and if I had a bit of luck and won something, well one can imagine that this would then become quite exciting. It was always interesting to watch the horses come onto the track before each race and, as I really didn�t know the horses, it was the only way to get an idea which horse might be the one to win the race. The newspapers provided indications as to which horses were the favorites for each race and sometimes you might use this information to make your bet. What I liked to do, however, was to look at the jockeys and see which horses they were riding. There were about eight to ten jockeys that were always riding in quite a few of the races and you then realized that these jockeys tended to ride the better horses. It wasn�t always the case but, then again, you didn�t always have a lot to go on either. Statistics are a big part of horse racing. Some horses were better over certain race distances and others were only successful when ridden by certain jockeys. I never studied any of the statistics but I recall one particular story in the newspaper that mentioned that there hadn�t been a 5-4 exacta during that particular race season. An exacta is bet you make by choosing who you think will be the first and second place finishers in a race. 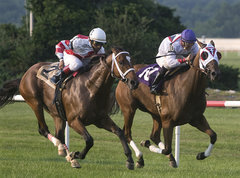 The 5-4 exacta mentioned in the newspaper indicated that the numbers 5 and 4 horses had not finished first and second respectively in any race so far that season. I don�t know why but I kept this in the back of my mind on one particular visit to the race track, but I did. The horses came out for a race and I noticed that two of the jockeys that I considered to usually be riding the better horses were riding the numbers 4 and 5 horses. I usually just made bets on the horse I thought might win, but for this race figured was the time to make the exacta bet for the 5 and 4 horses to be first and second. It was only a hunch but most of the time you really didn�t have anything more to go on. Off to the ticket window I went and I placed my bet for the exacta with the 5 and 4 horses to finish first and second. Some experienced betters, if they liked 2 horses to be first and second in a race, would buy 2 exacta tickets; one ticket with one horse winning the second ticket with the other horse winning. This is how they would hedge their bets but I only had in mind 5-4, in that order. Ticket bought, fresh drink in hand, and the race announcer says �and they�re off�. I don�t really remember the first part of the race but I recall perfectly as the horses came around the last bend and the 4 and 5 horses were neck and neck for the lead. The other horses were close behind but not threatening to overtake either one of them. It was only going to be a question of what order they would finish in. The race was very close and the race announcer yells out the horse�s names as they cross the finish line and lucky for me it was the 5 horse finishing first with the 4 horse in second. I couldn�t believe it. If I hadn�t read that silly statistic in the newspaper there was no reason that I would have made an exacta bet. Back to the ticket window I go to collect my winnings, which came to something over $500. I should have taken the newspaper columnist out to dinner but I ended up using the money to put new tires on my car, of which it was in desperate need of. Buy on Amazon : Betting on Horse Racing For Dummies - A book by Richard Eng with hundreds of satisfied customers.